Adapt your camper shell, hard tonneau or hardtop resin roof to carry all your gear with this fixed-mount roof-rack system. Vortex Aero, aluminum crossbars permanently bolt to your roof. Works on roofs without headliners. 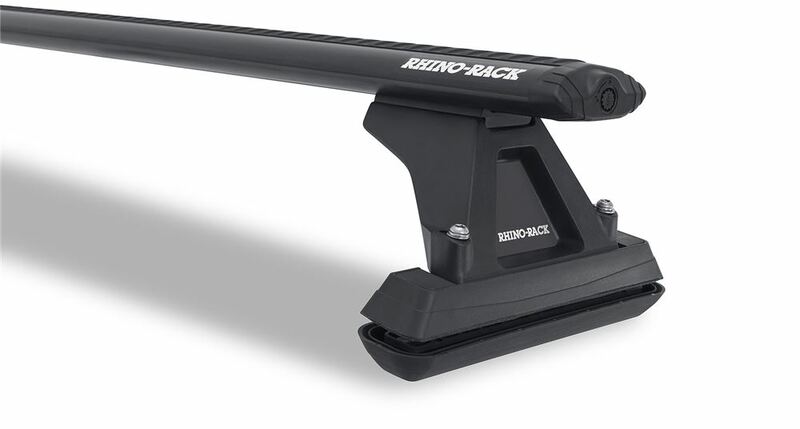 Fastest Shipping and Guaranteed Lowest Prices for Rhino-Rack Roof Rack System w/ 2 Aero Crossbars - Fixed Mount - Black - 54" Long. Read our customer reviews of Rhino Rack ladder racks. Call 800-298-8924 for expert service or order your ladder racks part number Y03-320B by Rhino Rack online at etrailer.com. Order: RelevanceNewestRating - High to LowRating - Low to High Adapt your camper shell, hard tonneau or hardtop resin roof to carry all your gear with this fixed-mount roof-rack system. Vortex Aero, aluminum crossbars permanently bolt to your roof. Works on roofs without headliners. Yes, the Rhino-Rack Roof Rack System # Y03-320 is available with black crossbars on our site. The part # Y03-320B is what you are looking for. No you should not cut the crossbars of the Rhino-Rack Roof Rack System # Y05-450 to mount them to your 2005 Toyota Tundra's camper shell. Doing so will compromise the integrity of the bars and their load capacity; they are not designed to be cut or otherwise modified.